This organization used a symbol that appears similar to the Masonic square and compasses. It consists of the typical Masonic square and compasses, with an arm holding a hammer in the center. I have also been told that the ritual of the JOUAM was very similar to Masonic ritual. The following information is from http://www.lib.udel.edu/ud/spec/findaids/jouma.htm - a webpage from the University of Delaware Library, Special Collections Department. through the Public School System. maintain the Public School System. only 8,500 social members and about half as many insurance members. Preuss, Arthur. A Dictionary of Secret and Other Societies. St. Louis, Mo. : B. Herder Book Co, 1924. 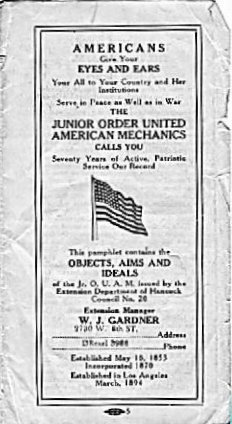 Schmidt, Alvin J. Fraternal Organizations. Westport, Conn.: Greenwood Press, 1980. 171-172. Whalen, William J. Handbook of Secret Organizations. Milwaukee: Bruce Publishing Company, 1966. Please note that I no longer am updating the webpages about Freemasonry. I still maintain my memberships but otherwise I am not active.